With the explosion of the condo market, we are seeing more and more homes with tiny kitchens seeking to make the most of a small footprint. 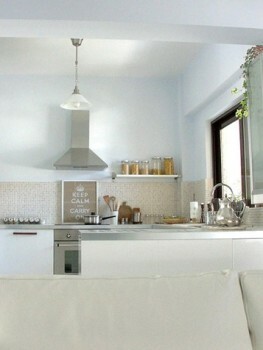 Many people are turned off by the idea of a small kitchen but it doesn’t have to be cramped and unattractive. In fact, many small kitchens are quite charming in their own right: it’s more about how you use the space than how much of it you have. Here are a few great examples of beautiful, inviting small kitchens that may help you plan a kitchen makeover of your own! This high ceiling kitchen makes the most of its height by using a reflective, expansion white which helps to give the room an illusion of extra space. The light tones throughout maintain a sense of airiness which combats feeling cramped and closed in and the large window allows lots of natural light to set off the cream mosaic backsplash and stainless steel counters. Keeping the kitchen organized is key to preventing that feeling of clutter and closeness and the sleek lines help accentuate the space and add a perception of roominess. This charming, modern kitchen is tucked away underneath the stairs leading up to the second floor in order to make the most of this small loft space. The stairs are open-backed to allow plenty of light to pass through and the large island does double-duty as a prep space and a dining area. The island is a great idea here despite its heaviness as it allows for plenty of extra storage while separating the kitchen area from the rest of the loft. The sink, stove, and fridge are lined up along the outer wall to make this kitchen easy to use and navigate and the modern surfaces and cabinets complements the modern design of the loft. This gorgeous kitchen fits nicely under the angled ceiling in order to fit as much in as possible. The stove is tucked back into the cabinetry in order to take up as little space as possible and the dining table is butted right up against the back of the island prep space so as not to waste an inch. The blond wood stains and stainless steel accents help keep the room light while the dark accents ground in the room and set off the charming, unique angel of the ceiling. 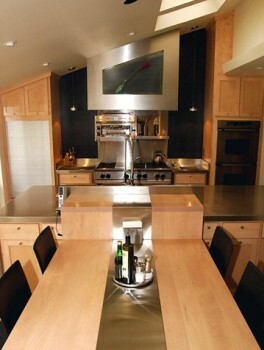 The skylight is a great addition and brings lots of natural light right into the cooking area.